Extensively revamped in 2008, San Sebastian’s aquarium has an enviable waterside position at the foot of Monte Urgull, is one of the most up-to-date in Europe, despite its location in a 1928 building. 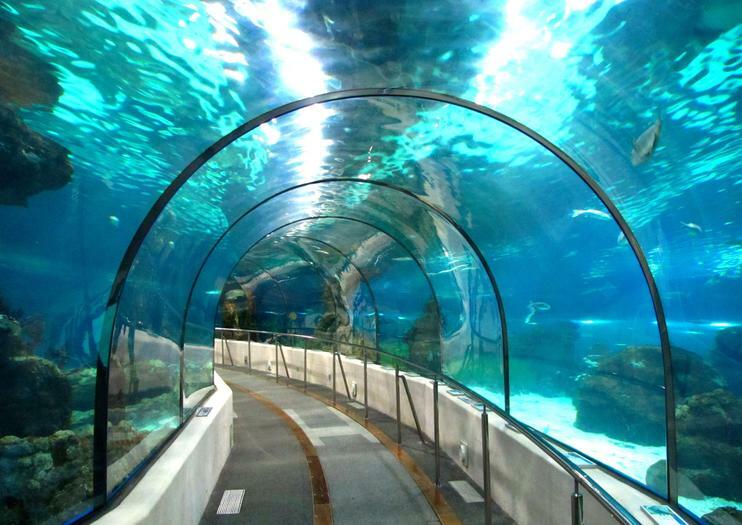 With 31 aquaria featuring marine eco-scapes from Cantabria and the tropics, the premier attraction here is the 360-degree perspex tunnel that dives through the Oceanarium while more than 40 species of fish, including bull sharks, turtles, sinister stingrays and jellyfish, swim merrily past. A small museum of marine history displays the bleached skeleton of a whale caught off the Atlantic coast in 1878, and a smattering of fascinating whaling and fishing boats that showcase San Sebastian’s enduring relationship with the sea. San Sebastian’s Aquarium is at Piazza Carlos Blasco de Imaz, 1, and admission is €13 for adults, €9 for seniors and students, €6.50 for children ages 4 to 12 and free for those under 6. The aquarium is open daily from 10 a.m. to 7 p.m. or 8 p.m., depending on the season. Explore San Sebastian at your own pace with this independent 3-day tour that includes two nights of accommodations, snacks, drinks, a city map, vouchers, and an admission ticket to the Aquarium in the city. You’ll also receive an information booklet, so you can see top attractions you won’t want to miss during your stay.